K40 METAKAOLIN is a novel flash-calcined high-reactivity metakaolin (HRM). Its high pozzolanic reactivity makes it ideal for use in Portland cement blends and cement-based plasters, mortars and concrete. The particle size is similar to the particle size of cement, which promotes an intimate and reactive mix. It has also been successfully used and tested as a pozzolanic ingredient in Geoploymer formulations. The pozzolanic reactivity is defined through the metakaolin’s ability to react with free lime as the by-product of Portland cement hydration. Addition of K40 metakaolin to cement can improve strength, durability, density and resistance to chemical attack. It also reduces alkali-silica reactions and efflorescence in the finished product. 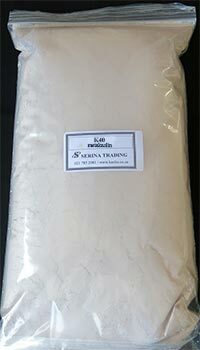 Metakaolin is an inert powder that if stored in a dry covered place, can be kept indefinitely.